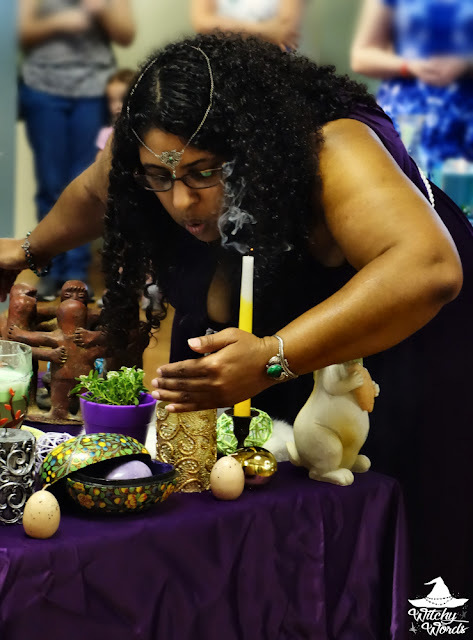 On Sunday, March 19th, Heena Lushede Coven held their public Ostara ritual at Aquarius in downtown Kansas City, Missouri. Though good old KC has had back-and-forth weather regarding spring, this past Sunday was a gorgeous day perfect for public ritual. Heena Lushede had quite the turnout! 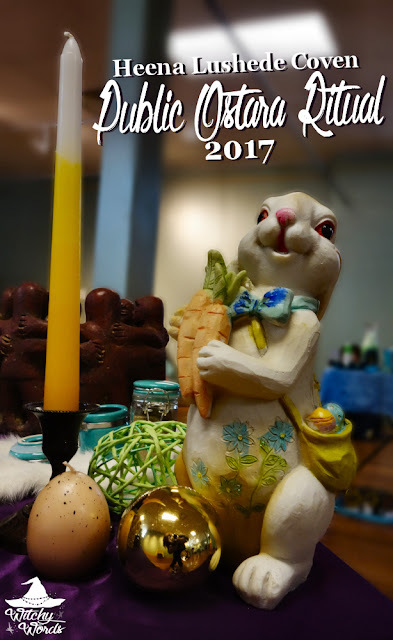 This year's Ostara ritual was led by the lovely Conswelia! I think I particularly need to point this out because, publicly humiliating myself a little bit more than has already been done, I tripped over the staff under the main altar while taking pictures, turned the altar a full 45 degrees which then spilled the purified water and knocked off a rabbit, whose ear then flew about 20 feet across the room. In retrospect, it was hilarious - like a scene right out of a sitcom. Of course, I was mortified in the moment. After years of photographing public rituals, I've never even bumped an altar. So if the altar looks a little different from above in future photos, that's why. My apologies once again to the ladies of Heena Lushede, and thank you again for being so sweet and understanding! Coven members would actually later bump the altar too. Conswelia noted that they recently replaced the quarter altars and this one knows it's on its way out. We'll, uh, blame the altar and not my two left feet, sure. On a day that is not a day." An athame was used to consecrate salt and water to create purified water, then incense and the burner to create purifying incense. These were then passed about the circle in a clockwise motion from coven member to coven member to cleanse the circle. 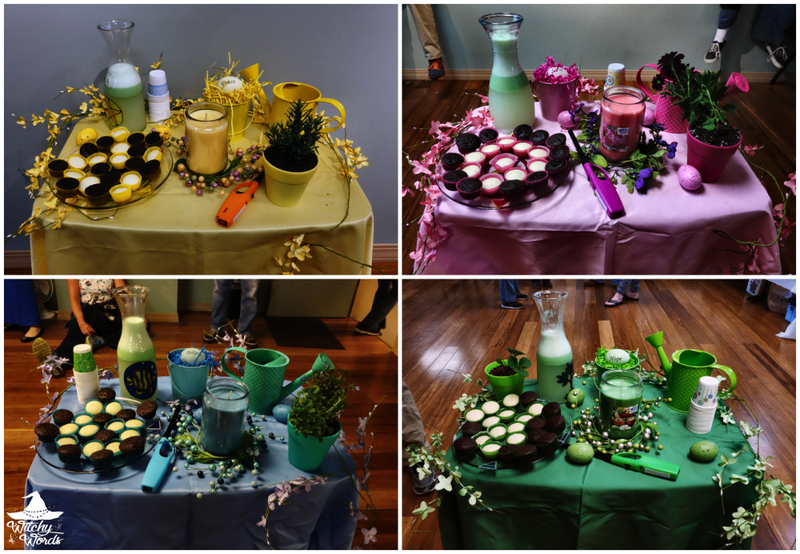 Conswelia then took a moment to introduce the holiday, emphasizing an observance of the balance of the sun and moon that has been honored for thousands of years within the Spring Equinox. Corners were then called one by one in a clockwise motion, starting with Air/East. The god and goddess were called upon as well and a candle was lit for each on the main altar. Conswelia then spoke about the balance of the equinox, a day where we seek stability and equilibrium. With this, she told the story of Nemesis, the daughter of Nyx, who was a goddess charged with rewarding and punishing individuals based on their actions. Her job was to maintain balance by fairly distributing both good and bad, but she soon became off-balanced and dole out primarily punishments. The goal of this story was to emphasize that even deities can become unstable, stating that it's okay to seek a helping hand in times of imbalance. After asking the Lord and Lady to help each of us regain stability and balance in our lives, each of the quarters raised a tray of planters. Chosen so they would regrow each year, each pot contained a perennial seed ready for planting. She also offered an incense blend the coven used for ritual to once again help attendants find balance in their lives. ... and passed around the room. But the ritual wasn't over just yet! During the last portion of the ritual, two individuals were brought forward to dedicate to the Wiccan path. The read a pagan pledge, as pictured above, were anointed with oil, and a white cord was tied around their waist to signify their dedication to the Wiccan faith. Congratulations to the new dedicants! ... as was the circle. As always, celebration doesn't stop with ritual. Heena Lushede public rituals always include a potluck dinner and a wonderful raffle to help support the rental of Aquarius's community space. Though I couldn't stay because my coven's ritual was on the same day, but there's certainly much fun to be had afterward! 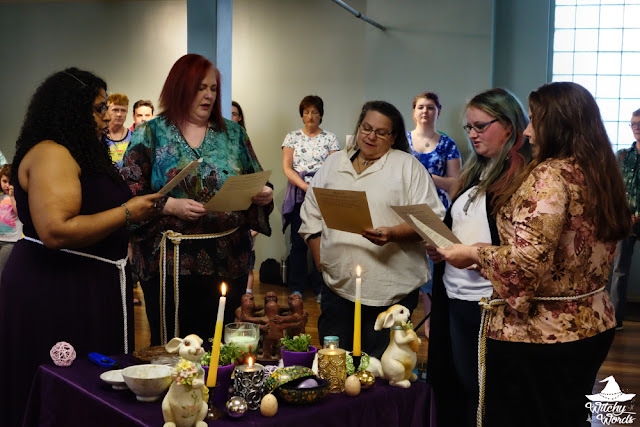 If you'd ever like to attend a Heena Lushede Coven public ritual or any of the other wonderful pagan community meets around Kansas City, check out the Kansas City Witches Meetup group for more information! I hope everyone had a fantastic Spring Equinox!